The JR Yamanote line is probably the most popular and convenient way for getting around Tokyo. Japan Rail Pass holders can take advantage of the line for free. Taking any train on the Yamanote line is fully included in the JR Pass. Furthermore, this is the only line that connects all of Tokyo’s most famous central stations such as Shibuya, Shinjuku, Ikebukuro, Ueno and Tokyo Station. The line is 34,5 km (21,44 miles) long. Read on for our complete guide about it. Taking the JR metro and making a full circle on the line will take you approximately 1 hour. The first Yamanote train begins its service at 4:30 am, and the last one passes at 01:20 am. This is with the exception of the 31st of December and the 1st of January. For more detailed information on the Yamanote line’s timetables, check out Hyperdia. During rush hours a train passes each 2,5 minutes. The standard waiting time for a train on the Yamanote line (off peak hours) is every 3,5 to 4 minutes. The one thing you need to remember about all Japanese trains, buses, trams and metro lines is that all of them are extremely punctual. Some of the biggest delays last no more than 5 minutes and if such a thing happens, you will hear a sincere apology on the speakers. Yamanote line – The circular (loop) line that connects all metro lines. It also connects Tokyo’s major city centers. Chuo line – This is a rapid metro service that crosses the Yamanote line. It connects Tokyo station with Shinjuku station. Keihin-Tohoku line – It runs parallel to the Yamanote line on the eastern side of it and stops at Ueno, Tokyo, and Shinagawa stations. Sobu line – It runs across the Yamanote line, similar to the Chuo line. However, it is the slower one of the two. Saikyo line – It runs parallel to the Yamanote line on the western side of the circle. Besides, the Tokaido Shinkansen trains stop at Tokyo, Ueno, and Shinagawa stations. 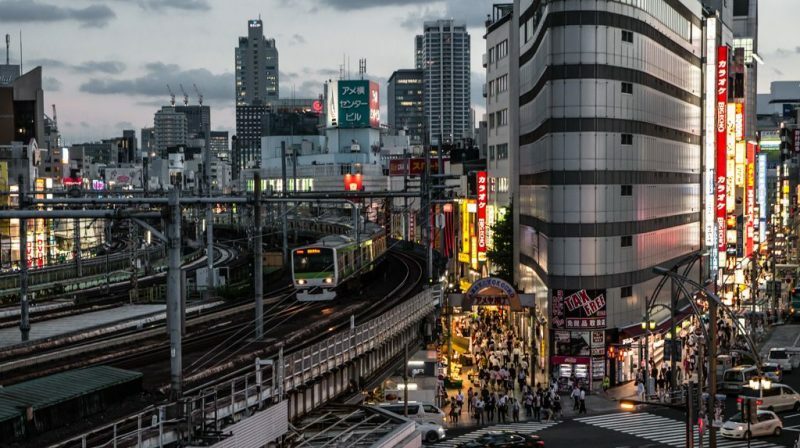 Shinjuku Station is maybe the world’s busiest train hub, with over 2 million passengers going in and out on a daily basis, and connecting with the Narita Express to Narita Airport, among other lines. 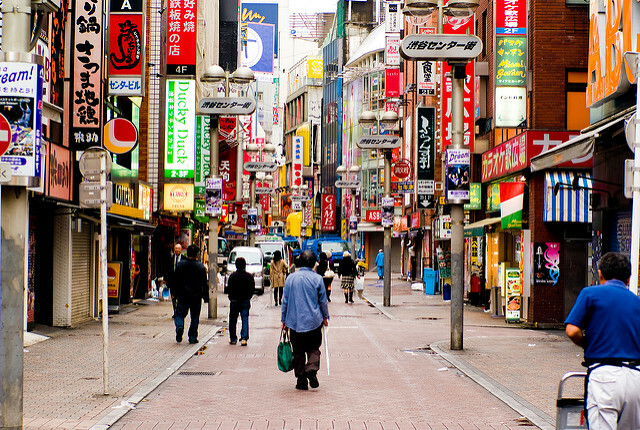 Apart from a station, Shinjuku is also the name of an important business and shopping center. Make sure to visit the observatories on the 45th floor of each of the twin towers of the Tokyo Metropolitan Government Office for some great views of the city. 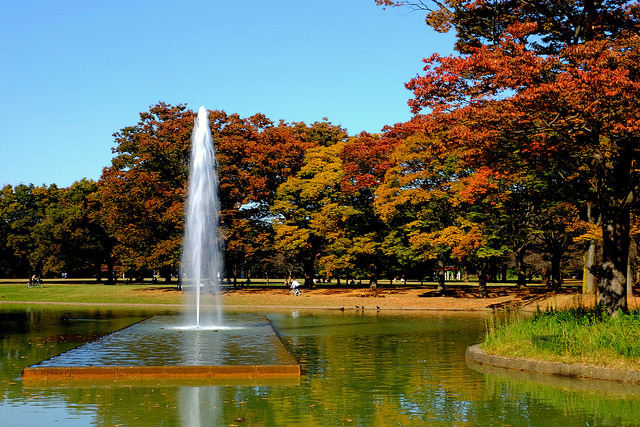 The Shinjuku Gyoen National Garden is a quiet and serene garden. Perfect for leisure walks away from the city noise, this garden is the home of a countless number of small and authentic Japanese bars. And if you still can’t get enough, visit Kagurazaka – a great neighborhood with a lot of restaurants, offering delicious food at reasonable prices. You can also visit Shin-Okubo, which is the next station counter-clockwise. 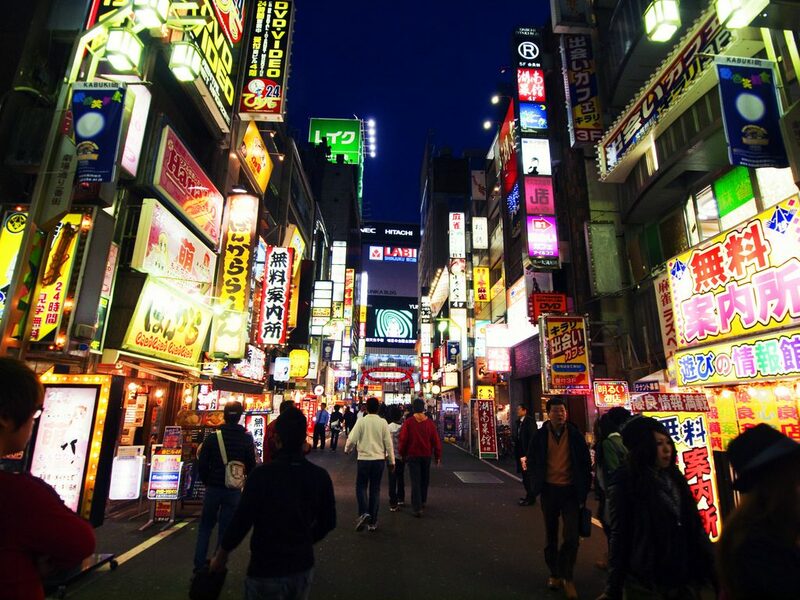 This is the entrance to Tokyo’s very own Korean town, a vibrant area full of street food stalls, markets, karaoke, bars and restaurants reminiscent of South Korean culture. The Yoyogi station is situated between the north entrance of the Meiji Shrine, part of the Yoyogi Park and the Shinjuku Gyoen National Garden. The garden is quite famous in Japan because of the animated movie “The garden of words”, based on these same gardens. The Yoyogi station is located in very close proximity to the Shinjuku station. The Harajuku station exit will guide you straight to the south part of the Yoyogi park as well as to one of the most famous streets in Tokyo – Takeshita. This is the trendy shopping street for many young Japanese. The Omotesando Hills is a large shopping center where you can find many local Japanese brands. Another popular option for such shopping is Oriental Bazaar. First and foremost, the Shibuya Station is famous for the busiest intersection in the world – the Shibuya crossing. Apart from this, the area is one of the largest shopping centers as well as one of the most active business centers. The commercial center called Shibuya 109 is the place to see all the recent fashion Japanese trends. Make sure not to skip the Center Gai street. Apart from countless restaurants and shops, this is the place where the fashion sense of the area comes from. If you wish for a different experience, visit the Bunkamura cultural center. You will be welcomed by a variety of exhibitions, as well as two different cinema houses and, of course, a number of places to grab a bite. In the quiet and residential area of Ebisu and Meguro, the Meguro canal gains popularity every spring when the cherry trees growing on the riverside start blossoming. Furthermore, from this station, you can easily reach the Institute for Nature Study and the Tokyo Metropolitan Teien Art Museum. Tokyo Station (Tokyo-Eki) is the central station as well as a terminal station for all Shinkansen bullet trains. It is located in Marunouchi, which is one of Japan’s most prestigious business centers. Visit Kitchen Street, situated within the building, for a variety of national Japanese restaurants. 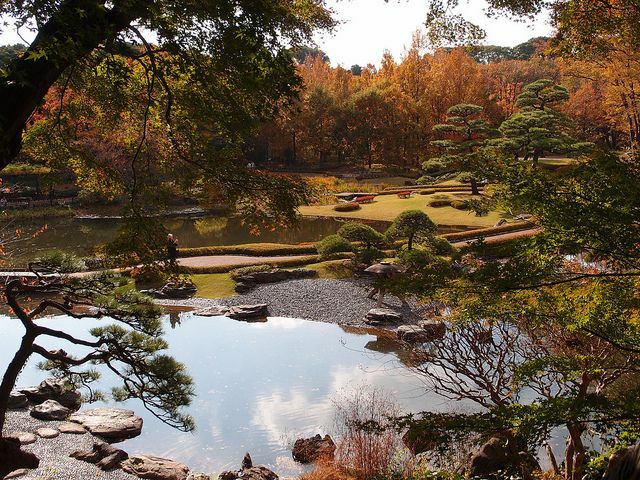 The Imperial Palace East Garden is a great option for a relaxing walk in nature. Do not miss out of the beautiful night lights of Tokyo station after sunset. Furthermore, Akihabara Station is one of the biggest central districts in Tokyo, famous for it numerous electronic shops in the famous “Electric city”. Akky, Yamada Denki, and Sofmap are just a few of countless shops, forming part of this uprising global electronics, geek mecca and trade center. All Shinkansen trains that go to the north of Japan stop at Ueno Station. The Ueno Royal Museum and Ueno Park are located in very close proximity to the station. The park offers access to several beautiful little shrines within its territory. 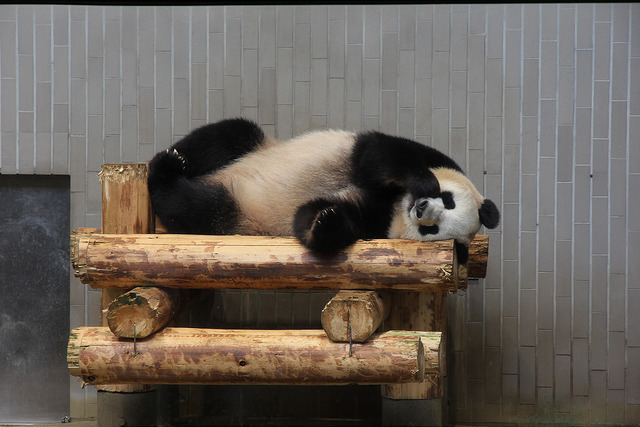 The Ueno Zoo and the Tokyo Metropolitan Art Museum are also part of the giant park. The JR Tokyo Wide Pass 3 days (Yen 10,000.-) can be used for the Yamanote Line and can be used from Shinjuku station to Hakone-Yumoto Sation ? Me and my wife planning a Week long Holidays in Japan, arriving in Osaka on 28.9.2019 and will spend fews days at Kyoto and then Tokyo and before travel back to Osaka Kansai International Airport on 5.10.2019 to fly back home. Should we opt for JR Pass during our stay ?? 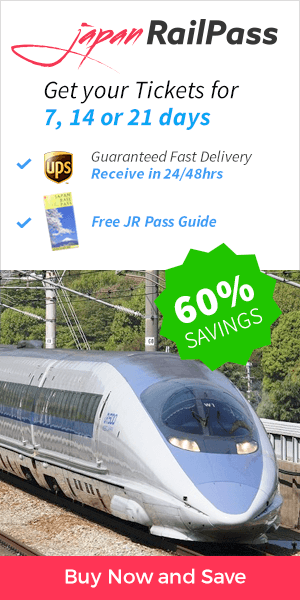 Should you order a Japan Rail Pass? Is it really worth it? This depends on how much traveling you will do, but in the vast majority of cases, the answer is yes. We have a couple of weeks in Japan. We are planning on a week in Tokyo (local travel + couple of day trips to nearby townships), a week in Kyoto and Hakone. Do you recommend buying the JR pass or just purchasing the tickets directly? Hi, we will be in Tokyo in May for 4 days hence intend to move around using Yamanote line. What is your recommendation cos the minimum pass is for 7days? Also, we arrive in Haneda at about 10pm, is there any train for us to hop in to Shinagawa. Many thanks in advance. Hi Vincent! There are rare occasions when it is not worth buying a JR Pass and it comes down to simple math. As previously mentioned, you only need to make one long-distance trip using a Shinkansen bullet train to save money. For example, if you only took an airport transport each way and did not leave Tokyo (and used the metro and bus each day), this would cost around ¥13.730 which is less than the 7-day JR Pass (¥29.110). Happy travels! So can I use the JR pass everywhere in Tokyo? Because our hotel for instance is located in Shinagawa, and I think the nearest station connects with the Rinkai Line. There are many locations around Tokyo that I wish to visit. Is it the smart to buy the railpass in order to get around easily from place to place in Tokyo? – The Rapid Chuo Line. – The local Chuo-Sobu line. – Other metropolitan lines that circulate on the outskirts of the city such as the JR Keio line, JR Musashino line, JR Nambu line and JR Yokohama line. Don’t forget to check the complete train maps of Tokyo and its area in our Japan maps section! Happy travels! I’m spending 14 days in Japan and I’m planning to go from Tokyo to Kyoto and spending 5 days in Kyoto and coming back to Tokyo. From Tokyo I want to make a day trip to Hakone. Which pass would you recommend? Would the 14 day JR pass be cheaper for me than getting the 7 day JR pass and using a Suica? Hi Henna! If a 7-day Japan Rail Pass can cover all your trips between Tokyo and Kyoto, to Hakone and one of the transfers to/from the airport, the best option would for sure be this together with a prepaid IC Card such as SUICA. Enjoy your stay! My family and I will be buying a standard 7 days pass and will activate it on the first week of July. One of the trip is going to Mt. Fuji and hike for only 1 -2 hour before returning back to the 5th station. I prefer going to the Yoshida Trail. Is there a train-bus via jrpass to Yoshidaguchi 5th Station? is only good to Gotemba station and from Gotemba station I would need to take a round trip bus to Gotemba 5th station? Or should I just take a round trip bus in Tokyo to Yoshida trail (Yoshidaguchi 5th Station) ? What route should I take? Hi Randy! With the Japan Rail Pass you can reach Gotemba Station (take JR Tokaido line for Kozu from Tokyo Station, once at Kozu take the JR Gotemba Line for Numazu and get off at Gotemba Station). Once at Gotemba station, take a bus to Subashiri 5th station (not included in your Japan Rail Pass), the gateway to climbing Mount Fuji. One-way bus journey is about an hour long, at the cost of 1.540 yen (round trips are 2.060 yen). Happy travels! Not sure if i’m better off buying a JR Pass or not? I will be visiting for 10 days in March 2019, arriving in Haneda, first 3 days in Shinjuku (only using Yamanote line). Then I will travel to Kyoto, Osaka and back to Tokyo (planning to use shinkansen). The fare calculator shows that buying individual tickets is a bit cheaper than buying a 7 day pass. Question: last time, I used a Suica card to travel Yamanote line, very easy – tap in tap out. How do you use a JR Pass on Yamanote line? Question: is it easier to just use a JR Pass for all the travel as opposed to buying individual tickets? Hi Paula! The JR Pass gives you unlimited access to all Japan Rail National trains, JR bus services, ferry services, and airport transfers. A 7-day JR Pass only costs ¥29.110 which is actually cheaper than a return ticket from Tokyo to Kyoto on a Shinkansen bullet train, so in your case it might be the most cost-effective ticket available. When travelling within the Yamanote line, as well as you will need to do in other stations, just show your pass to the staff – as easy as pie! Happy travels! will the the JR pass cover these trips on the Shinkansen? Also I want to go from Tokyo to Kawaguchiko (to see Mt Fuji) can I use my JR pass for this trip too? Hi, we are staying at Disney (Hilton TB) and then on to Hakone. We have a family group of 8 including two kids and one elderly person. We need to travel from Maihama to Shinjiku at around 9 am. We transfer at Tokyo Station. If we take the Yamanote line, is it good for sightseeing? or should we just stick with the Chuo line to Shinjiku? We will not have baggage as we intend to use the luggage forwarding service. Thank you! Yes, the Yamanote line is good for moving around Tokyo and you can also use other lines like the Chuo-Sobu line. Please check out these links for further information. I arrive in Tokyo on the Monday, want to spend 3 days in and around Tokyo before heading South. If I buy a 7 day JR pass, does travelling free on the Yamanote line using this pass, mean I have to activate it first?e.g. can I use it for 3 days getting from the airport, around Tokyo BEFORE I have to activate it for the 7 day tour of Southern Japan? Hi Richard! While the Japan Rail Pass is not active you won’t be able to use it. Should you need it for the 3 days in Tokyo (Yamanote line) you need to activate it first. Happy travels! Hi, I wanted to know if the Japan Rail Pass will cover us for travel around Tokyo (we are staying near Tokyo Station) as well as for the Shinkansen out to Nagano? Is it also true that you can use the pass for 5 separate days in a 14 day period? Thanks. The Japan Rail Pass validity period is calculated in days, not in hours. Its days of use have to be consecutive. Therefore, if you have purchased a 14-day pass and your activation date (when you first use the pass) is the 1st of April, the exact expiration time will be midnight on April 14. 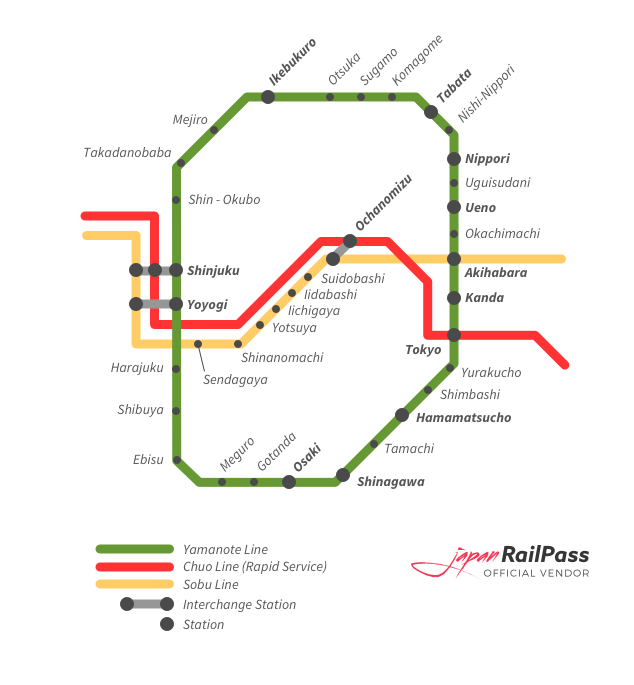 The JR Pass affords access to five main Tokyo railway lines: the Yamanote Line, the Keihin-Tohoku Line, the Rapid Chuo Line, the local Chuo-Sobu line and other metropolitan lines that circulate on the outskirts of the city such as the JR Keio line, JR Musashino line, JR Nambu line and JR Yokohama line. You can reach Tokyo via many of Japan’s Shinkansen lines. Within the city, the Tokaido Shinkansen makes stops at Shinagawa, Ueno, and Tokyo Stations. Also the Japan Rail Pass will cover your trip from Tokyo to Nagano. From Tokyo Station, you will just need to take the Hokuriku Shinkansen. hello – I have another question pls, I will be heading to Asakusa and I was told to take the “Tokyo Metro Ginza Line”, or “Toki Asakusa Line”, or “Tobu Line”, are all these lines covered by JR pass using the Yamamoto Line pls? I don’t seem to be able to locate this info from here, appreciate your soonest reply and whatever help/advise you can provide in terms of the train stations with JR pass to Asakusa is super highly appreciated. Hi La! There is no JR station in Asakusa and hence there is no way of arriving by only using your Japan Rail Pass. You can use the pass to travel to the Ueno Station from Tokyo Station in the Yamanote line and there take the Tokyo Metro in Ginza line to Asakusa (not covered by the Japan Rail Pass). Asakusa is the last station of the line. We will be arriving in Tokyo on December this year and we will be staying in a hotel near Okubo Station. My question is, is it practical to buy the Skyliner package that includes a 72-hour unlimited ticket if we will be staying there? Need your advice on which transport ticket to buy to save money. Hi, we are a family of 4 with 2 kids under 6 years. We would like to travel from Kyoto to Tokyo by Nozomi train but would like to understand. Since both kids are eligible for free travel without reserved seat. Is it applicable in a case when we (parents) will buy reserved seats and hold our kids sitting on our knees? In case the other seats next to us would be not utilized is it ok to seat kids in there until travelers having those seats reserved get on the train? How do I travel from Narita International Airport to Machiya using the JR Rail pass? You can take the Narita Express from Narita Airport to Tokyo Station and then change to the Yamanote line to Nishi-Nippori Station. There, you’ll have to change to the Chiyoda line (not included in the JR Pass), two stops north bound to Machiya Station. I am arriving Tokyo on 15th May at 8.30 pm. I am assuming the immigration bit will take an hour. I will then go to the JR pass counter. My hotel (E hotel Higashi) is in Shinjuku. Will there be Narita express available post 9.30-9.45 at night? Which are the other ways of reaching Shinjuku using my JR pass. Do I have to reserve the seat also? where do I do that? Hi Revati! Last Narita Express train from Narita Airport to Tokyo city center leaves at 21.44h. To access the train, the desired seats must be reserved in advance, which can be done at any of the Narita Airport terminals. Hello there~! Just wanting to know how to get to Hakone (Mt. Fuji) from Tokyo Station? Hi there! I will be in Tokyo for 2 weeks- 14 days. Landing Tokyo then Kanazawa then Kyoto then Osaka then back to Tokyo. I am looking to purchase the JR rail pass however just wonder if i can use the same pass to get around in each of the above cities? like in Tokyo for sure we plan to visit Shinjuku and Shibuya. hi there, sorry another question- is the JR rail pass valid for transportation to and from Narita Airport to Tokyo? thanks!!! Yes! You can travel for free from Narita Airport to downtown Tokyo with the Narita Express, as it is included in the JR Pass! – Other metropolitan lines that circulate on the outskirts of the city are the JR Keiyo, Musashi, Nambu and Yokohama lines. Last but not least, while in Osaka you will be entitled to make full use of the Osaka Loop Line. Hi, I am only going to be visiting Tokyo with total of 4 adults mostly along the tourist places along Yamanote line. Is there any pass that only uses that line? There’e too many passes I don’t know which one to get or if I should just use the suica card? thank you! The SUICA Card services JR trains in the areas of Tokyo, Sendai, and Niigata including transport by train, subway, monorail and bus, but no bullet trains, long-distance trains or airport transfers. I am planning to by combined limousine &metro pass. Can I use this metro pass on Yamanote line? Hi, we are traveling with two children, both under the age of 2. I was wondering if thr JR trains are stroller friendly? We have double stroller (two sweaters) and we would like to know if we can get around taking the train with kids on the strollers. Thank you for your reply. The stations are well equipped and the elevators and escalators will help to ease your station access. Strollers are also allowed on board of Shinkansen bullet trains free of charge. The only requirement is for them to be folded and safely placed in the designated places. Hi regarding rush hour time, if maybe i will be leaving from ueno to ikebukoro in afternoon rush hour time. will that be really crowded train? or shibuya to ikebukoro in the afternoon is it also really crowded? Hi regarding this topic, if maybe i will be leaving from ueno to ikebukoro in afternoon rush hour time. will that be really crowded train? The morning rush hour tends to be a bit heavier than the evening rush hour. Those tend to be crowded but do not be intimidated: with a little prior planning, you can avoid the crowds all together. If you have the option of taking a bullet train or a local train, always choose the Shinkansen, as they are designed for long-distance rather than local travel. We hope you have an amazing time in the country! If you have a Japan Rail Pass, you can freely use the Yamanote line as well as the Chuo – Sobu that crosses Tokyo from east to west, the Tokyo Monorail that goes to the Haneda airport, and the other JR lines that go to the peripheries of the city. For a deeper look at what is included in the Japan Rail Pass, check our section of “Using the JR Pass” for a clear understanding of all you can do with your pass. How do I get from the Tokyo Station to Hiroshima using the JR pass? I do not see the Shinkansen trains that are available with the JR Pass, only the Nozomi which are not included! To go from Tokyo to Hiroshima you can use your JR Pass to take the Sanyo Shinkansen line’s Hikari bullet train from Tokyo Station to the Shin-Osaka Station. You will then transfer to the Sakura train (on the same line) and arrive in Hiroshima at Hiroshima Station. Is there hotel accommodations at Yamanote Station? Is it convenient to go to Hokkaido on JR Pass from Yamanote Station? The Yamanote Line stands for a whole line and not only a stop. It covers a large area and in all stations is possible to find a hotel – we recommend you to search for it in any hotel price comparison website. Did you know you have hotel discounts with the Japan Rail Pass? Regarding traveling to Hokkaido it will depend on the part of the island you want to reach but generally you will be able to access all of them with the Japan Rail Pass, specially if your accomodation is close to one of the Yamanote Line stops. For example, if you aimed to visit the capital of the northern island of Hokkaido, Sapporo, you should take the JR Tohoku / Hokkaido Shinkansen to Shin-Hakodate Station. From Shin-Hakodate Station, you will take the Hokuto limited express or Super Hokuto trains to Sapporo Station. Both are covered by the Japan Rail Pass. We have 1 year and 4 year old daughters. Do we need to buy the JR passes for them? -On 9/30 from shinagawa will go to Kyoto and will be back to Tokyo on 10/1. Babies and children under the age of 6 are eligible to travel free of charge on all JR public transport. However, please note that you will not be able to make any seat reservations for your child if they don’t have a valid train ticket (Japan Rail Pass). If there are no available seats, children can be held by their parents in the unlikely event of full train cars. – Once you land at Narita Airport you will be entitled to travel in the Narita Express at no additional charge if you are a Japan Rail Pass holder. It will take you straight to Shinagawa. When you leave you can make the trip the other way around. – Getting from Shinagawa (Tokyo) to Kyoto with the Japan Rail Pass is easy: you should take the Shinkansen Hikari train from Shinagawa Station and arrive at Kyoto Station, and to go back to Tokyo you can just make the trip the other way around. A standard Tokyo to Kyoto trip with the JR Pass takes close to 1 hour and 40 minutes. – To get to Tokyo Disneyland use your JR Pass to travel from Tokyo Station to Maihama Station, on the JR Keiyo line. Travel time is 20 minutes and the park is a mere five-minute walk from the station. Hello, I will go to Tokyo for one day (only). Is there a daily pass for JR Yamanote Line? The Yamanote is part of the JR East line and this there is no specific pass only for this line. The Tokyo 1-day ticket allows unlimited rides on local and rapid JR East trains (excluding reserved seats) within the 23 Special Wards of Tokyo as well as on the subways, the Nippori-Toneri Liner, Tokyo Toei streetcars and the Toei Bus system. Will be staying in Ikebukuro area for my visit to Tokyo in November. May i know when is the peak/rush hour to avoid if i’m travelling to below areas in the morning. Rush hours in Tokyo during weekdays are between 8 and 9 in the morning and around 5 in the afternoon. Please note that leaving Tokyo in those hours is generally less crowded than traveling towards Tokyo. Hi. I will be taking the Yamanote Line from Shinjuku to Osaki on the 16th of August, may I know what to expect as I will be there at 6:40am. I’m in Misawa and will have to ride the night bus on the 15th. Is it going to be crowded by that time and in that route? May I also know the rush hours. Thanks in advance. Sorry for the late reply! In August, you should have no crowding problems. However, please check our article about the rush hour in Japan. Hello we will be arriving to Narita in September. From Narita airport to Aoyama Itchome station , what train and connection will Jr Pass covers. Also from Tokyo to Kyoto for one night then onto Osaka. Can you please help me draft out what are the options. Thank you very much. We suggest you check out the Hyperdia page for schedules and itineraries of all the JR trains. You just need to tick the Japan Railway(JR) box and you will get all the detailed information about timetables and routes of the JR Pass trains. You can also check out our article about the best routes from Tokyo to Kyoto. We are sure you will find everything you need there. Enjoy your trip!! We are flying in to Haneda airport then going to Kyoto. We get to the airport at 445pm on August 11th. Will there be a built train that we can take to get to Kyoto that evening? We are then going back to Tokyo the morning of the 13th staying at APA Hotel – Higashishinjuku Kabukicho Higashi which is in the Shinjuku Ward district. What trains would we take? Also we want to go to several areas around Tokyo such as Tsukiji Fish Market, the Imperial Palace Area, Shinjuku and Akihabara. Can you suggest lines to get to the different areas? Will we need to pay for transportation outside of the Rail pass? In this article you are reading you have all the stations in Tokyo that can be reached with the Japan Rail Pass. Additionally you might want to read our article about how to get around Tokyo with the JR Pass, which will give you some additional details. Please note that if you want to travel besides these lines you will be required to pay additional tickets so we recommend you to plan your trip in advance so that you know what to expect. To go from Kyoto to Tokyo you need to go to the Kyoto Station and take tge Shinkansen Hikari, that will take you straight to either Tokyo Station or Shinagawa Station in central Tokyo.